Homeschool parents need to be aware of ways to power-up the homeschool transcript. Their homeschool high schooler’s courses need to be college-attractive while broadening their life experiences and developing their skills and interests. One of the best ways to create a powerful homeschool transcript is to avoid generic courses where possible. Instead, have your high schooler take courses that will add *sparkle* or *pop* (as college advisors often call those). For instance, instead of generic World History on the transcript, a powerful homeschool transcript would show something more individualized or geared to an interest area. To power-up the homeschool transcript, History and Philosophy of the Western World is a much better choice. To help homeschool high school students power-up their transcripts, 7 Sisters has gathered all our power-up texts into one Power-up the Transcript Curriculum Bundle. AND to help you create a powerful homeschool transcript, we are offering the Power-up the Transcript Bundle for 20% off the individually-priced texts…it’s like getting one book free! 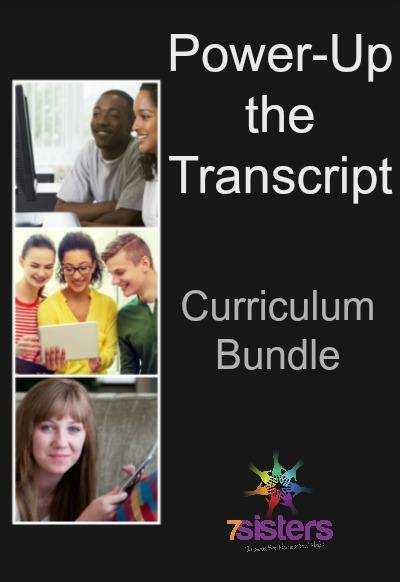 PLUS with the Power-up the Transcript Bundle, you will receive a sample year-by-year schedule of the 26 credits your homeschool high schooler needs for graduation (the short-term goals for your school) – all at 20% savings. Early Childhood Education (Great life preparation for any homeschool high schooler who wants to be a parent someday. This light-hearted, fun course is a career exploration credit that helps explain how to teach pre-schoolers. It can be used to level-up an average Human Development credit to honors. PLUS you get a 4-year guide explaining when to cover all 26 courses you need for graduation. A great way to start creating a powerful homeschool transcript. All these bundled together for $139.92 – a 20% discount off the normal price for the individual texts of $174.90. Download your copy of Power-up the Transcript!